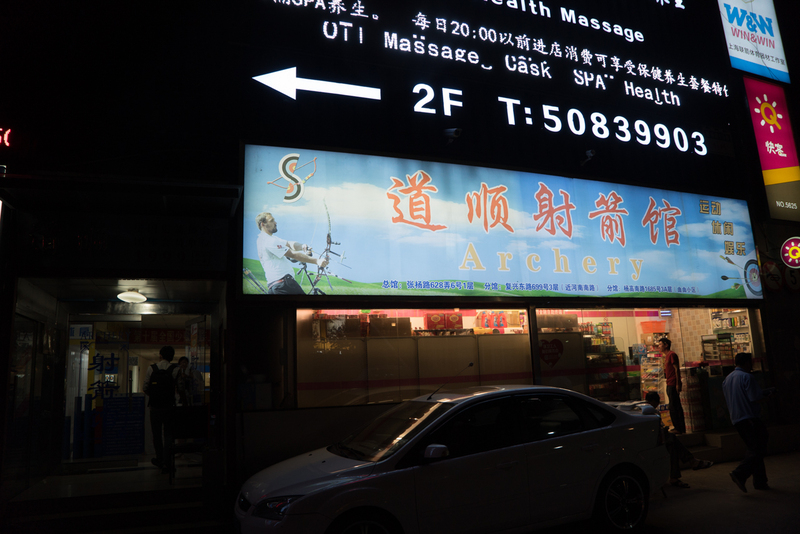 Daoshun Archery has locations throughout Shanghai. It’s a great place to go as a group outing, or even by yourself. Not being an archery professional myself, I can’t speak to the quality of their bows and arrows—but I do know that after only one round I’m usually making eyes at the more “professional” models with sleek balance systems that people bring in to use. 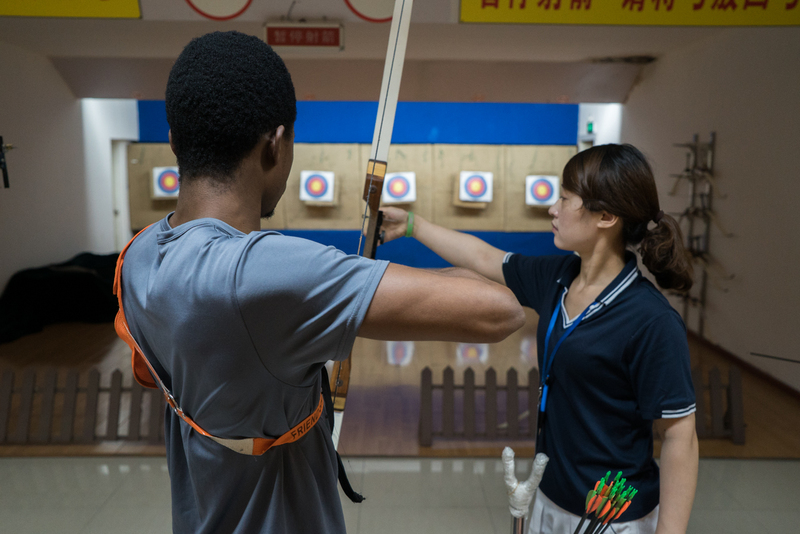 Attendants at the arena will help you understand the basics of archery, and help to adjust your scope while you shoot to make it more accurate. I’ve found that if you really want to get your scope adjusted you’ll need to plan on shooting at least a few rounds with the same bow on the same lane (which can sometimes be hard to do if you go with a big group and are constantly taking turns on one of the same three bows and lanes). Don’t shoot when the red light is on (this means that a worker is at the other end collecting someone’s arrows and doesn’t want to be impaled by a stray shot). Don’t “twange/snap” the string with no arrow inserted (it needs someplace to release the tension, if there is no arrow it can break the string—my dad found this out the hard way with a bow he got for his birthday). Stand with your feet facing the side wall—this means you should be standing perpendicular to the target. Use two fingers to draw the string back to just below your chin/jaw. Lots of space for a larger group to hang out while waiting their turn to shoot. With your lane rental you’ll get equipped with an arm guard, finger guards, a chest guard, a bow and arrows. 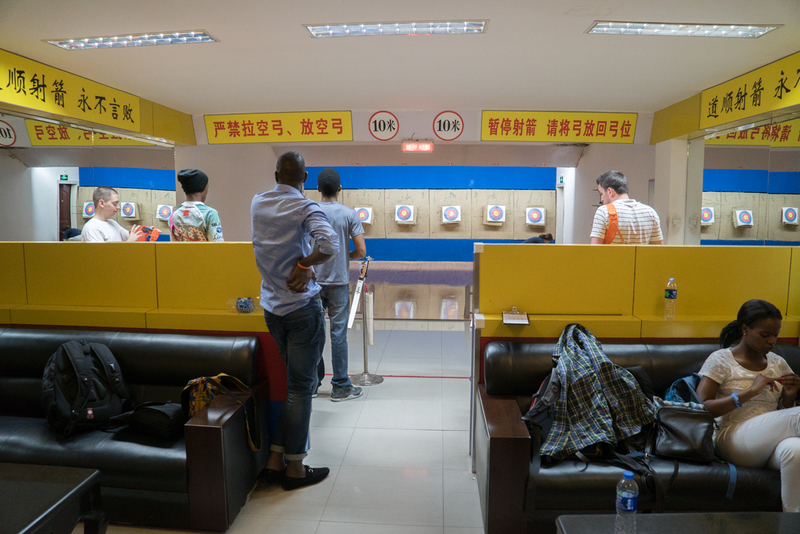 One of the attendants will help collect the arrows and total your score after each round. * Membership card: ¥300: 25% off; Silver: ¥1000: 83 tickets/rounds; Gold: ¥3000: 250 tickets. Along with the tickets when you purchase the card, your membership card will also give you at least 20% off each time you go. Both long-range and short-range lanes are available. I recommend going with the short-range—it’s harder than it looks! Metro: Laoximen Station (Lines 8/10); Yuyuan Garden Station (Line 10); Xiaonanmen Station (Line 9). Metro: Shangcheng Station (Line 9), 5 min walk from exit 2, straight up Nanquan Bei Lu. Century Ave Station (Lines 2/9/6), 10 min walk: Exit 12, left of Zhangyang Rd. Dongchang Station (Line 2), 15min walk: exit 3 to Nanquan Rd towards Zhangyang Rd.